Habit: Bulb with 1--several large fleshy scales, 0--many small scales. Stem: erect, simple (0 in non-flowering plants). Leaf: cauline, alternate, subopposite, or whorled below, sessile, linear to +- ovate (1 bulb-leaf in non-flowering plants). Inflorescence: raceme; bracts leaf-like. Flower: generally nodding, bell- or cup-shaped; perianth parts 6 in 2 whorls, each part with distinct glandular area in lower 1/2; stamens 6, included, attached at perianth base, anthers attached +- near middle; ovary +- sessile, style 1, +- entire or 3-branched. Fruit: capsule, loculicidal, thin-walled, +- rounded, 6-angled, or winged, chambers 3. Seed: many, 2 rows per chamber, flat, +- brown. Species In Genus: +- 100 species: northern temperate. Etymology: (Latin: dicebox, from fruit shape) Note: Bulbs of some eaten by Native Americans. Habit: Large bulb scales 2--8, small 0--3. Stem: 1--4 dm. Leaf: 2--10, alternate, +- crowded near ground, 2.5--10 cm, ovate. Flower: nodding to spreading; perianth parts 1.5--3 cm, white with purple spots or lines and pink shading, tips often recurved, nectary obscure, +- = perianth, widely linear, colored like perianth; style divided 1/2. Fruit: acute-angled. Chromosomes: 2n=24. 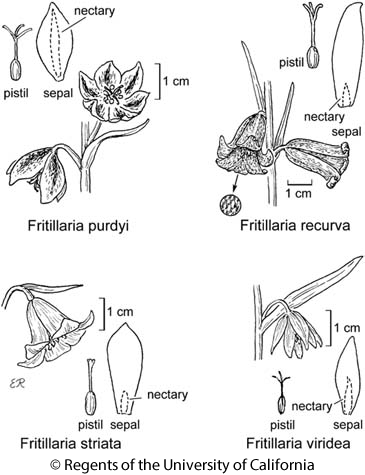 Citation for this treatment: Dale W. McNeal & Bryan D. Ness 2012, Fritillaria purdyi, in Jepson Flora Project (eds.) Jepson eFlora, http://ucjeps.berkeley.edu/eflora/eflora_display.php?tid=26162, accessed on April 22, 2019.